Today I thought I'd talk about my luxury favourites again as last time I had a much better response than I had expected when talking about higher end products. 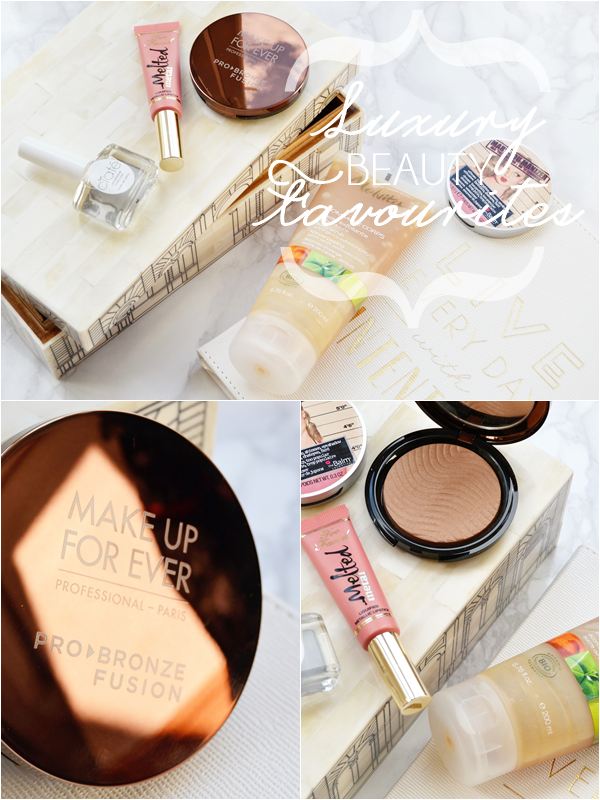 Below are just a few of my current favourites that I'd class as 'luxury' due to the price point of them or the fact I wouldn't normally spend that much... so it's quite a treat item. Also thinking of making this a monthly post as it's nice to feature more expensive products from time to time! If you read most of my posts then you will probably know that I mistakenly purchased theBalm Cindy-Lou Highlighter/Blush a few months back as I was wanting Mary Lou and they look oh so similar. I could have kicked myself but then my lovely friend Tanzina (of Makeup A to Z) surprised me with the one I meaning to get for my birthday - very lovely of her! Since then this product has become my daily highlighter. The luminous glow it gives to the tops of the cheeks is just WOW. With contouring I really feel my face looks more sculpted and slimmer. What makes this a luxury product for me is how beautiful and soft the powder is and how natural it looks on the skin - it really stands out from all the other powder highlighters I own. Plus Mary Lou also can be used as a shimmery eyeshadow (again, lovely) and to highlight other areas of the face such as the cupids bow and brow arches. If you love a luminous glow with highlighters then this is certainly worth buying. A base coat for my nails is an essential as I have quite porous nails which stain easily. So for the past few years I haven't skipped using one before applying nail polish. This not only prevents my nails from staining/turning yellow but gives a smoother finish and makes the manicure last longer! But sadly Base Coats on the high street/on a budget are few are far between so high end ones it is. So far I've tried ones from China Glaze, Orly and OPI but have been more impressed overall with this Ciate offering. The reason for this is that it feels like a top coat - it applies smoothly and dries fast. It also provides such a smooth base for nail polish and fills in ridges in the nails. This is an overall good egg of a product that I've been using religiously to keep my nails in check. The only criticism I do have is with the packaging. It comes in a lovely box but then the nasty grey sticker on the back can be seen through the bottle... not the worse thing ever but not what you'd expect from a £12 nail polish! As I mentioned above sometimes a luxury product can be something you wouldn't spend so much on normally and that is certainly the case with this in-shower body scrub. For me this is a total luxury product that I treat myself to each spring/summer as it's such a glorious scrub to use. Unlike other scrubs this is light yet effective with it's orange peel and sugar cane granules that are suspended in a soft and refreshing gel. The smell might also have something to do with why I love it so much as it reminds me of orange jelly babies... that fresh orange scent with a sugary hit - just so yummy! This lasts me all spring/summer and I just couldn't not treat myself to it. Make Up For Ever have finally launched in the UK and I for one am excited about it! With such high quality products I really think the brand will stand out in the market. So when this wonderful bronzer arrived through my door to celebrate the UK launch I was more than excited to try it out. Though I was expecting high quality I really didn't expect it to offer anything unique other than the beautiful 3D design to it. But it did! 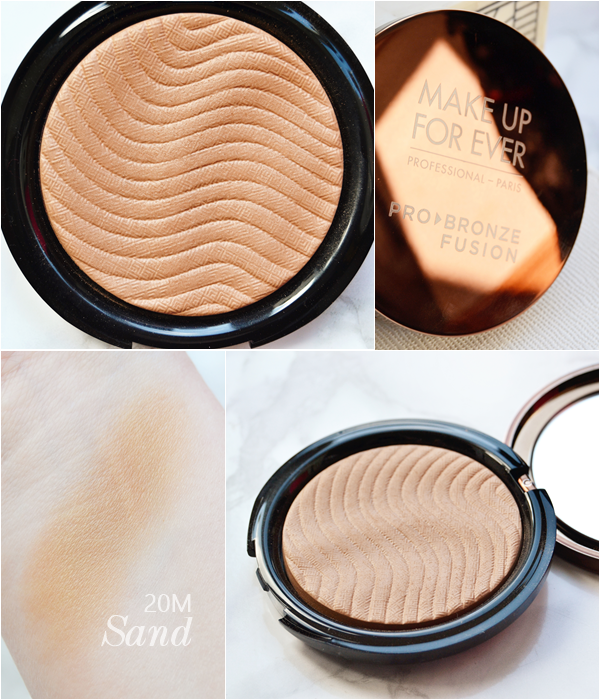 The bronzer is actually a gel/powder fusion that is unlike anything I've tried before... strange as it sounds this to me is just colour without it actually looking or feeling like a gel or powder product. I'm aware that sounds totally bizarre but on application and how the bronzer looks on the skin you cannot detect it's a powder or anything else for that matter, making it look beyond natural. Also the matte yellow under toned shade for my pale skin works perfectly however as the undertones are different from the norm I'd suggest that swatching is a must. Also a dense kabuki or contour brush is needed to pick up the gel based product. Totally unique and the future of bronzers I hope! Lastly a fairly new product that I've been so so in love with recently, I mean just look at that golden peach shade in the light! It's going to be a summer lip staple I can already tell! 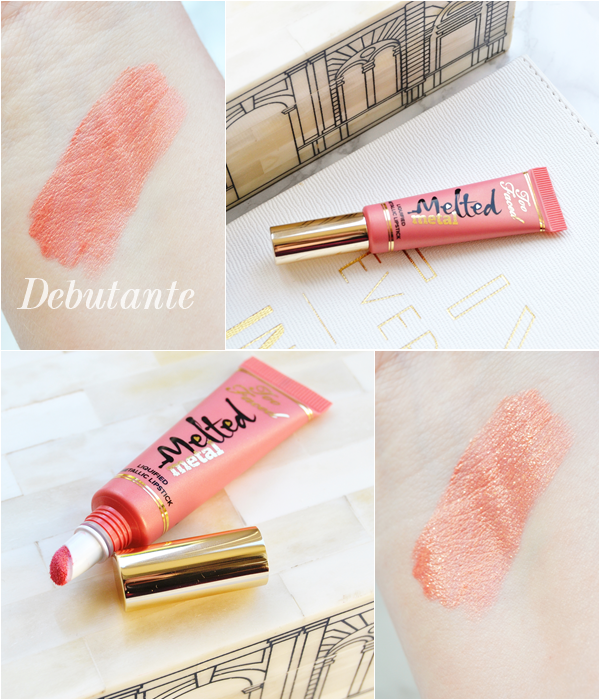 Much like the original Too Faced Melted Lipsticks the product offers a silky liquid that covers the lips with a high pigmented shade that not only lasts for 4+ hours on the lips but feels so comfortable. But with the metallic versions there's this stunning micro shimmer running through it that's flattering and just so pretty. For me 'Debutante' is a perfect hot summers day shade and one to flatter all skin tones. But I now have my eye on 'Peony'... actually I lie, I want the whole damn range! Another product that offers something totally different and unique. Love, love, love! 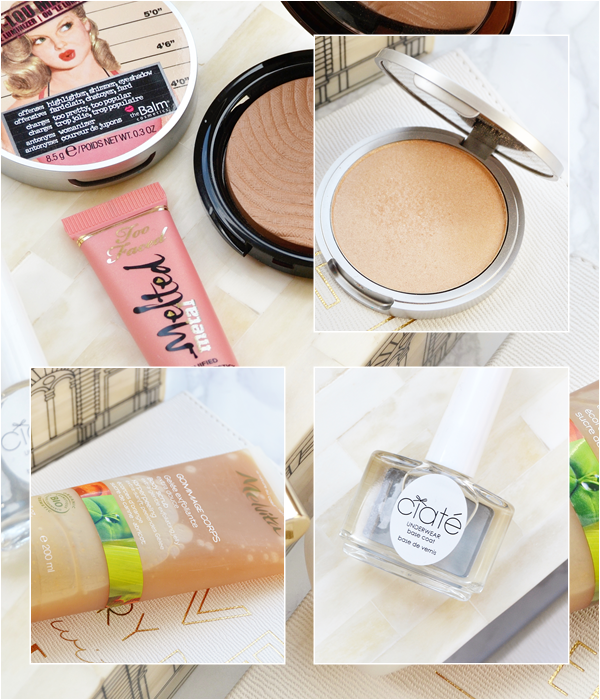 As these are all more expensive products than the bulk of my makeup collection I feel seeking on voucher codes to be a great help on my bank balance - even if it's just 10% off! 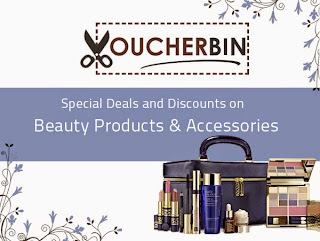 Voucher Bin is one of those great websites that makes it easier, offering codes and savings for Feelunique.com, HQ Hair, Philosophy products plus many more websites. Worth checking out if you are having a splurge! Hope you have enjoyed this post! Let me know your own luxury favourites at the moment.. just don't tempt me too much!